In my family we have a tradition of making an album quilt for any couple who makes it to 50 years together. It began in 1977 with my mom’s parents’ anniversary. 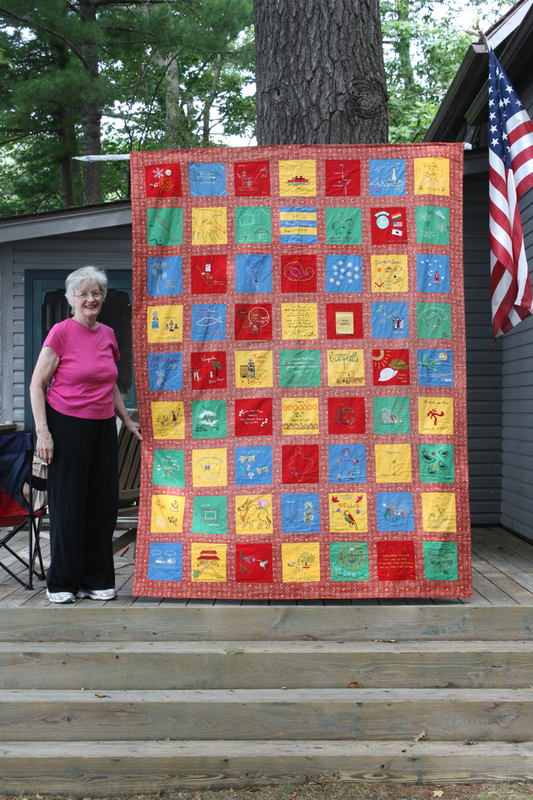 My first cousin, Nancy, came up with the idea for the first quilt. 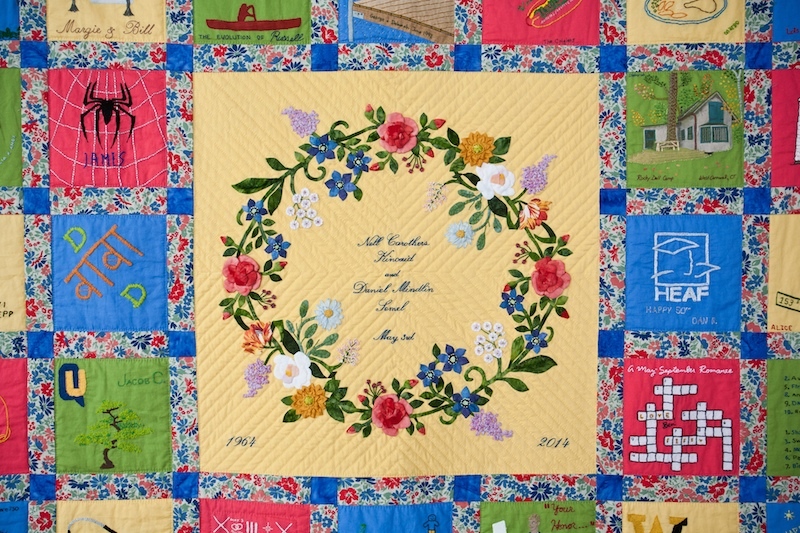 She and my mother’s older sister, Martha, and my mom, Nell, sent out squares of fabric to family and friends of my grandparents. We all worked diligently to hand-embroider relevant designs or messages (or both) that would remind the happy couple of us. Back then, it wasn’t so unusual to be asked to craft something by hand, especially when so many of those being asked had been missionaries or had at least lived abroad. Next, Nancy, Mom, and Aunt Martha sewed them all together while Uncle Parky was charged with taking us younger kids to various amusement parks in Southern California to keep our sticky fingers out of the way. Two years later it was my father’s parents’ 50th anniversary and my grandmother hinted that she’d like a similar quilt. An accomplished seamstress and knitter who’d kept seven grandchildren in custom-made skating costumes and sweaters, she was obviously worthy of the challenge! Only this time, it was just my parents putting together the quilt. This time, my Aunt Joanna and Uncle Dan were in charge of taking our three pairs of sticky fingers off to Florida, so that my Mom could tackle the quilt construction over spring break. And thus the tradition began. 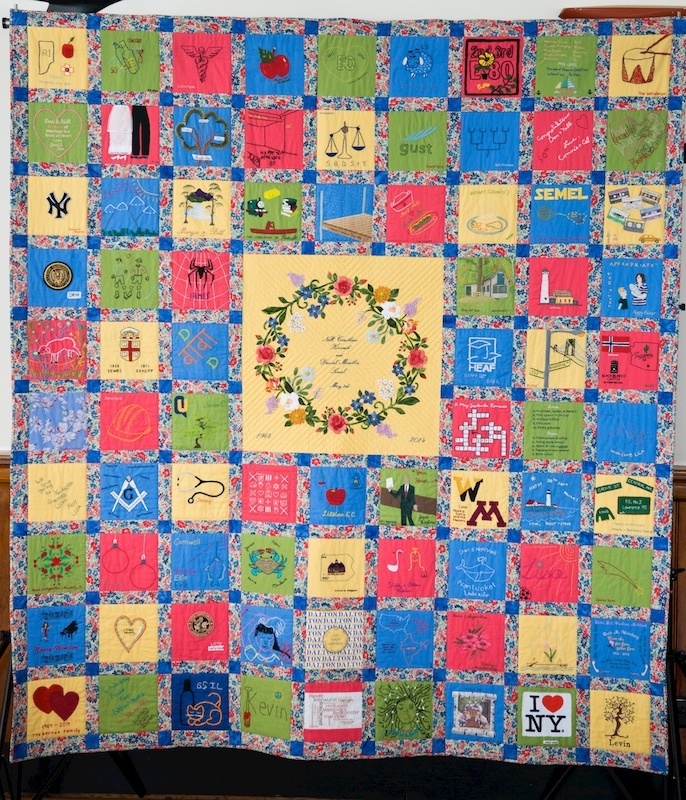 Nearly 25 years later, in 2006, Mom and I put together a quilt for my aunt and uncle. We’d forgotten just how enormous the task of organizing and sending the mailing of instructions and fabric squares was! Way more work than actually making the quilt, it’s the part of the process that I’d gladly outsource if I could. However, rather like childbirth, all that agony is quickly upstaged by the delight in receiving the clever and whimsical contributions that friends and family send in. Also, by this time, quilting was really my passion and I wanted to up the ante by adding a Baltimore-style center medallion. Using Elly Sienkiewicz’s Rose Lyre Wreath design (enlarged somewhat to a better scale for the quilt) I hand-appliqued a design element that turned out to be both bold and unifying – definitely something we wanted to repeat for future quilts. 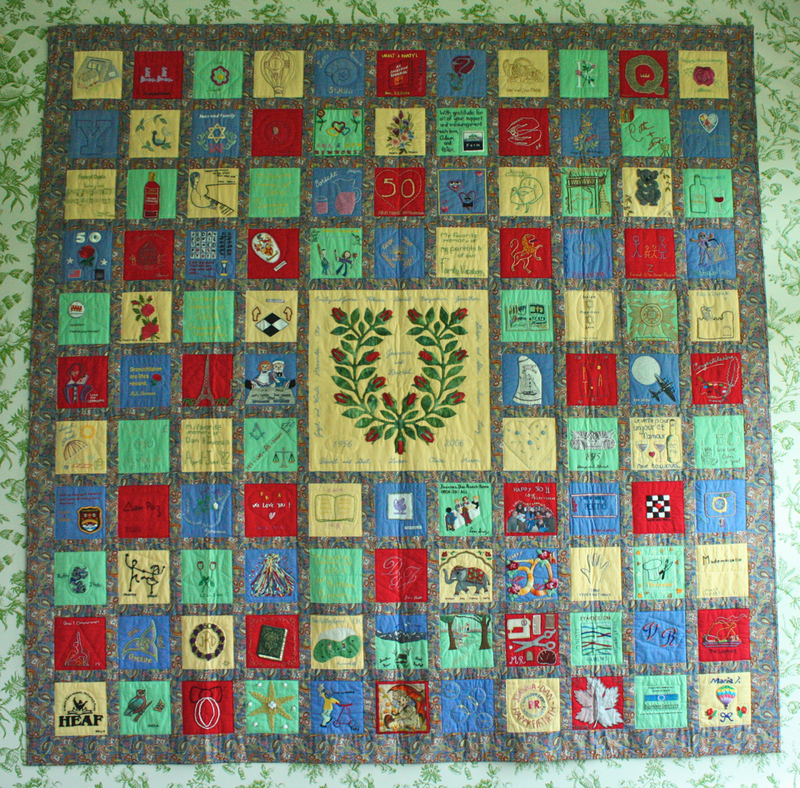 Next up was my in-laws’ anniversary quilt in 2008. Thank goodness for Mom and my husband, George, without whom I’d never have pulled this one off. By this time I was a full-time head teacher, in addition to everything else in our busy lives. George was not only a dab hand at the details of mailing out instruction packets, but he even taught himself how to embroider and design and executed his own beautiful square. My mom and dad made squares for themselves and for my brother who was traveling on the other side of the planet. Mom came and helped me assemble the quilt top, layer the batting and backing, and finally feed the quilt through the machine. Happily, after that quilt, there was a bit of a break. Which leads me to this year: 2014. My parents were married on May 3, 1964. I knew would be pretty much flying solo on this quilt. George and the boys would be helpful, BUT George has his business and the boys are, while charming and lovable, rather less biddable teenagers. I asked Mom to choose her fabric colors because after making all those other anniversary quilts, she should at least get to live with a quilt she likes! I started a year and a half early with the mailing, knowing that in the intervening 30-odd years the general public’s ability to make anything by hand has declined. Yes, this is the age of Etsy, Craftsy, Ravelry, and all things DIY, but few of that ilk are related to me. Nonetheless, I was impressed at how many people rose to the occasion and, when necessary, found someone to guide them along their embroidering journey. I agonized over the center medallion for so many months that I must’ve qualified for some world record in procrastination. Convinced it was to be my magnus opus, I wanted to draft my own design AND include techniques I’d never tackled before, like ribbonwork, beading and dimensional applique AND incorporate flowers like Mountain Laurel and Gardenia that have meaning to my parents. OY. Finally, after many versions, I settled on some elements from a corner swag in Janice Vaine’s book, which I cut up, revised and added to until I got what I wanted. I finished the wreath just in time to put the rest of the quilt top together and had great plans to layer and begin hand and machine quilting over spring break. Best laid plans. I have no pictures of what came next because I hope never to relive that particular nightmare. For some deluded reason I cannot recall, I decided to use a batting that I’d never worked with for a bed-size quilt or for hand-quilting. I’ve used Thermore for everything and it’s always worked beautifully. So after two weeks of trying to wrestle the quilt into submission, I had a Total Quilting Breakdown. Sobbing, tearing my hair, rending my clothes – OK, I exaggerate, but there was definitely much crying and drama involved. I had to pick out ALL my machine stitch-in-the-ditch quilting and some handquilting and Start All Over Again. I can testify that it was totally worth it and I just hope Hobbs never stops making Thermore during my lifetime. Mom and Dad threw themselves the 50th anniversary party of their dreams on May 10, 2014 at the Water Club and they got to see their quilt for the first time that day. It was pretty neat. I’m onto other quilt projects now – some new EPP and my ongoing, never-ending Dear Jane that I began in 2001 – the summer before 9/11. George and I will have our 25th anniversary in 2017, so I suppose I’ll finish that or another quilt for our bed by then. It’s kind of crazy that I haven’t made a quilt for our bed yet, but other quilters tell me that’s totally normal. Right, Andrea? You do such beautiful work, Deborah. 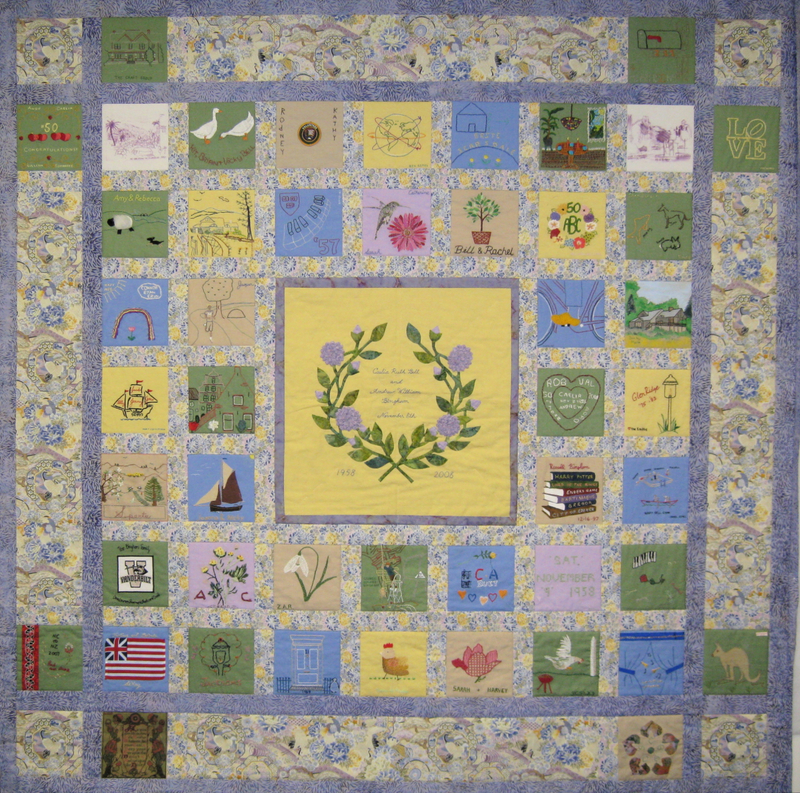 Every time I see this quilt, I’m stunned by its beauty. And one day we’ll both have quilts on our beds! Deborah: Thanks for sharing this. Lovely tradition. I can relate to picking out quilting stitches due to bobbin tension problems – thank the Lord for patient good friends who helped! I also don’t have a quilt on my own bed yet, but my daughter has a beautiful queen size one, her wedding gift. I may never go that large again. I too am still working on my Dear Jane – 7 loving years.